Departement of Vaucluse - Pop. 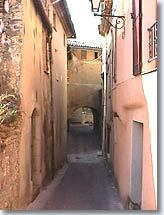 : 5,000 h.
Malaucène is the capital of the Ventoux and nestles within the old ramparts. It takes shape around its ancient fort, standing at the highest point of the village. 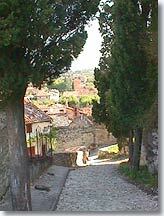 The old town is partly surrounded by a remarkable avenue lined with ancient plane trees. All that remains of Malaucène's fortified enclosure is a few of the gates. One of these, the Soubeyran gate, was used in former times as a gallows for publics hanging. 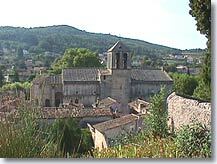 During the first half of the 14th century Pope Clement V had his summer residence in Malaucène. He left his mark on the town in the form of the church of Saint Michel . When you visit it, you will be amazed by its fortified appearance with machicolations, pillboxes and other military-type elements (rather rare in a religious building) and also its blend of Romanesque and Gothic style. Inside, you will see its case organ in gilded wood (1639), its pulpit entirely sculpted and its curious stone bench, 41.77 metres long, without doubt the longest in France. 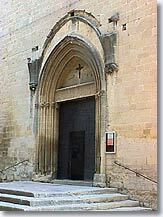 The chapel of Groseau, situated a few kilometres away on the D97 road to Mont Ventoux, is all that remains of a monastery dating from the 7th century. It was destroyed by the Saracens and then rebuilt in the 11th century. Pope Clement V stayed there on several occasions. Little by little, Malaucène became a large market town by developing the same industrial activity over the last four centuries: the Papeteries de Malaucene. This paper mill specialises in manufacturing the tips for cigarette filters. Agriculture has developed alongside this and in the last few years tourism has also become part of Malaucène's resources. Strolling through the streets of Malaucene, you will be able to admire the beautiful residences dating from the 16th to 18th centuries, the ancient fountains and the wash-houses. On the Cours Isnards you will find restaurants, café terraces and hotels as well as numerous shops. Not forgetting the market on Wednesdays. This will provide an opportunity to buy, not only the famous "blanches", "burlats" and "coeur de pigeon" varieties of Ventoux cherries that the area is so well known for, but also asparagus, apricots and other produce from the region. 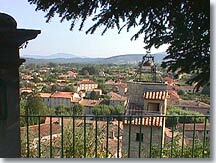 Malaucene is the starting point for many walking trails and horse-riding trails to the Mont Ventoux. (Don't miss the superb trail that leads up to the panoramic viewpoint at Calvaire). There are numerous leisure activities available here for children and adults. If you feel like something different, less Provencal but quite picturesque, why not visit the experimental farm that breeds llamas on the Le Barroux road. You may also enjoy a visit to its weaving workshop. Gothic church with remains of fortifications. Sculpted pulpit and historic organ. The llama farm. The winter festival on Mont Serein. (guided tour with an officer from the National Forest Authority (O.N.F). 3 comfortable and renovated rentals for 4 to 8 pers. Holiday rentals: Houses, apartments, gites.